Run the video above to see the Vista Progress Bar in action. Well it looks like Sprezzatura’s Progress Bar article is having another run globally. Carl recently gave me a copy of his test form for the bar and I am pleased to confirm that it runs just as well under Vista with the new Vista looking Progress Bars. The article was first published in SENL volume 4, issue 4 back in March 2007. The full SENL can be found at http://www.sprezzatura.com/senl/senl440307.pdf. You will have noticed that the Dale’s code in today’s earlier posting is considerably better formatted than on my previous postings to this blog. This is all thanks to Carl at Sprezzatura who gave me a copy of a utility that he wrote to handle code postings for the forthcoming new Sprezzatura website and blog. Please drop me a line if you would like a copy for your blog or code postings to the Revelation forum. Dale Jessop from 3M recently needed to create a progress bar that is embedded at the bottom of his form next to a status bar (as shown in the image). He has kindly offered to share this technique with readers of my blog. I have both of the controls on the window and both are turned into their MS equivalents on the CREATE event, after which I run the following code which embeds the progress bar within the status bar control. Once the progress bar is embedded in the status bar you can use it the same as a normal status bar. I have also been able to mimic the behaviour of Internet Explorer by making the progress bar “appear, run and then disappear again”. From version 9.0, OpenInsight forms now support a background colour gradient to give your application a face lift in minutes. This can be set in a number of ways. You can set the gradient for every window in your application by using the Environment Settings found in the Database Manager. 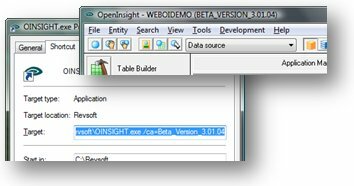 This window enables you to choose a ‘From’ and a ‘To’ colour for your windows and then checking the checkbox OpenInsight will apply the colours to all of the windows in your application. You can then override this on a form by form basis by checking the Background Colour checkbox on the window’s property sheet. Once checked, you can set a main colour (or from colour) using the ‘Background Colour…’ menu option from the form’s ‘Properties’ menu. Checking the Background Colour checkbox then enables the Gradient button on the window’s properties sheet. This button opens up the ‘Gradient Definition’ window in which you can select a number of gradient styles and also a ‘Grade To Colour’. Once set this specific form will then grade the background colour between your two defined colours. >Revelation USA has just announced the dates for the next Revelation User’s World Conference. Whilst still in the early planning stages, the intention is to return to the Rio All-Suite Hotel and Casino in Las Vegas, USA. The preliminary dates are the week commencing the 25th April 2010. I will announce further details about this major event in the Revelation calendar as they become available, but please put this date in your diary. With the advances in the OpenInsight and Universal Driver over recent versions, the forthcoming 9.0.1 and plans for 9.1, this is one event that you will not want to miss. A useful tip if you have several copies of your OpenInsight application for live, beta, test, R&D, etc. You can easily keep these in different folders, but wouldn’t it be nice to change the Application Manager title bar to reflect which on you are working in, rather than find that you have just run up and modified the wrong copy. In recent versions of OpenInsight, the number of switches that can be applied in the desktop shortcut used to launch OpenInsight has grown. For instance I now have different shortcuts to launch straight into my ARev32 demo, my new examples application, my WebOI demo and of course the standard SYPROG and EXAMPLES apps that come with OpenInsight – all of which are held in one copy of OpenInsight. to launch my new examples application. In this example, I use the /ap switch to launch straight into the application, passing in the username and password as applicable. I then use the /DV switch to take me into development mode and /IDE=1 to launch the new version 9.0 IDE. In addition, you can now use /CA to include your own text in the Application Manager window’s title bar in brackets. So for instance I might opt to have my application version number show (Version_3.01.04) or I might simply opt to have (BETA) to indicate that this is a beta copy that I am working in. The choice of text is yours, although it does have to be a complete string, so no spaces. >A series of new training dates are available on www.revsoft.co.uk covering all three of the main OpenInsight courses. In addition, I will be pleased to discuss any specific training needs that you might have for your current, or a future, project.